CeNTech scientists develop a method to visualize interactions between molecules with exceptional resolution in real-space. The method is based on low-temperature atomic force microscopy (AFM) and uses a copper-based probe tip, which is terminated by a single oxygen atom. The team around Dr. Harry Mönig, Dr. Saeed Amirjalayer and Prof. Harald Fuchs demonstrates the exceptional mechanical and chemical stability of this atomically defined probe tip. These properties allow a spatial resolution on the sub-molecular scale allowing to visualize the bonding structure of a hydrogen bonded molecular network. This study has now been published in Nature Nanotechnology. Left: Overview image of a self-organized molecular network (PTCDA) with a structural model of the tip. 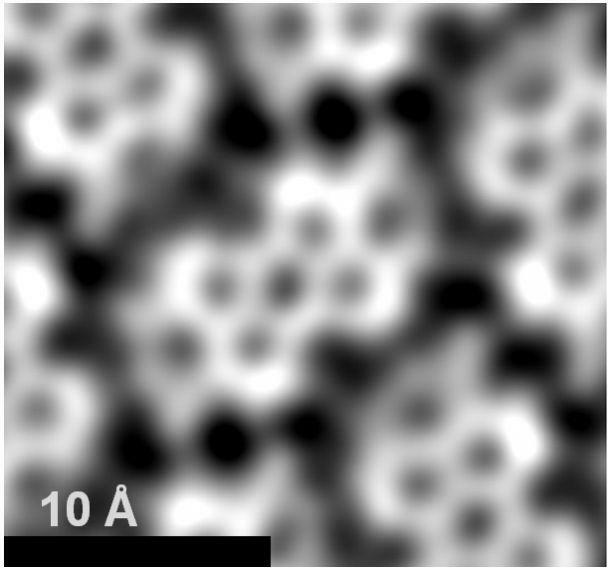 Middle: Enlarged excerpt showing a single molecule (center) surrounded by six partly visible ones. The faint lines between the molecules indicate dominant sites of hydrogen bonding. Right: structural model. © 2018 Macmillan Publishers Limited, part of Springer Nature. All rights reserved.